When we talk about our Chinese in-laws, our dear mother-in-laws are usually the protagonists. I am sure you are all familiar with Momzilla, and with Timo’s crazy MIL. Autumn is maybe the only one that sometimes puts her FIL on the spotlight (he truly deserves it, hehe). I have written about my Chinese MIL before (and it is one of my most viewed posts ever), but my FIL has never been properly introduced on this blog. It’s time to put an end to that! C.’s father has a small convenience store in the alley where he lives. He mainly sells drinks and cigarettes to the neighbourhood people, mainly old people and migrant workers. He sits in the store all day, watching dvds on a portable dvd player, listening to the radio or chatting with the passersby. Before, he used to be a sales representative for a Chinese watch brand, so when C. was a kid he went to many places in China with his parents. But when foreign brands started coming to China, this watch factory couldn’t cope with the competition and had to close, so he lost his job. When people see C. and his dad together, they always say that C. resembles his father. So I know what I will have to face when we get old! Their physical resemblance is truly remarkable: before C. got his braces almost 2 years ago, even their teeth were extremely similar (in a bad way). 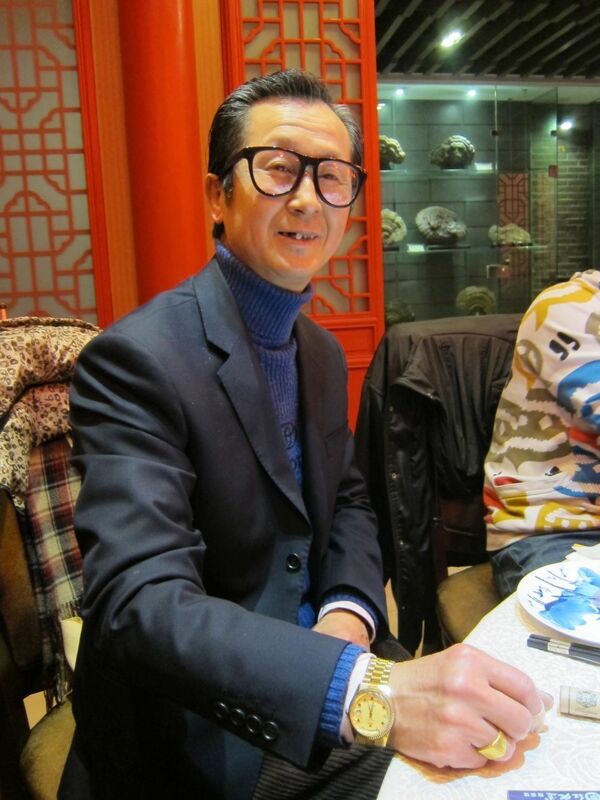 If he is not in the store, you can probably find him playing mahjong with some neighbours. He loves dogs and is very fond of Nico. He can cook some dishes (and often puts too much salt for my taste) and doesn’t own a mobile phone. His Mandarin has a strong Suzhou accent and sometimes I can’t understand when he speaks. C.’s father is always smoking and when we go to a restaurant he always brings his own alcohol, 黄酒 huangjiu or yellow rice wine (bringing your own drinks is acceptable in many restaurants in China). When there is a special occasion, like Chinese New Year, he likes wearing his gold watch and ring. We joke and tell him he looks like a mafia boss. The glasses are fake. The gold is real. How is your relationship with your father-in-law? We usually go to see him after eating so I almost never eat anything from his store. But in the summer I accept ice cream some times, he he. At least I know that C. won’t get bald or have a belly when he gets old, ha ha. Oh wow! He doesn’t want to visit, like Momzilla does? Or is he busy with work? A lovely intro of your Chinese FIL. Congrats for the jobs!! I think older Chinese people, especially men, have a hard time expressing their feelings. Maybe you could try to make small talk with him, so he gradually sees that he can talk to you? Funny and interesting post. I have drank that yellow rice wine at a big banquet in Zhejiang Police College. OMG. So hungover. Hey, thanks for the shout out! Very kind. More FIL stories are coming…their first visit to our house was, um, something. Something unprintable, really. Your FIL seems very nice. For a mafia boss! LOL. Sounds like some catchphrase for a commercial. Haha, I agree that was funny! Hmm… “fie”… I wonder what is the Chinese word. Maybe it is Suzhou’s pronunciation of “bie” 别? I asked C. It is literally “bu yao”. Bu is pronounced “fu” and yao is “ye”. So when you say it fast, you pronounce both words together and it sounds like “fieee”, hahaha. Can’t really complain because silence and beers is a pretty sweet deal. Sure beats most of the relationships I ever had with former girlfriends parents. Language and cultural barriers can be a beautiful thing. Your FIL looks like a real character – in the best possible way. Love the watch and glasses photo. Not to hard to imagine absmoke and a glass of yellow wine added to the equation. Yes, I agree. Language barriers can be a blessing sometimes, haha. I think there definitely was a glass of yellow wine in the mafia boss picture, must have been a few more centimetres away from his hand! Hahaha me encantó la última foto!! Y oye si, por lo que veo se parecen bastante :) en mi caso mi pololo también se parece bastante a su padre, que bueno, nos sirve de referencia hahaha. El dialecto debe ser tan difícil! Mi pololo ya me advirtió que su papá casi sólo habla en Henan Hua :( su mamá (la cual conocí, al papá aún no lo conozco) habla en mandarín sin problemas así que pude comunicarme con ella, pero con el papá no se cómo pueda comunicarme haha. Pololo? Me encanta la pronunciación de esta palabra ! En cuanto al Henan dialecto, es parecido a la Putonghua, tú debes entender. Por otro lado, Suzhou/shanghai dialectos son asesinatos, verdad Marta? He he, I would be delighted to hear those MIL stories! Perhaps one of these days I’ll be brave enough to share! :-) The best tribute would be if I could capture some of her culinary secrets too! I also have a few FIL-stories on my list, so if you want one, I’ll pull them out from behind for you haha. Yeah, lived here for 25 years but only ever interacted with other Chinese. Couldn’t even go see a doctor by himself. He’s moved back to HK last year. I meant to comment last week, but I forgot! The first thing I thought was C looks more like his Mum than his Dad! Height and build he’s like his dad. Facial features his mum. But there are sunglasses involved in the said photo. 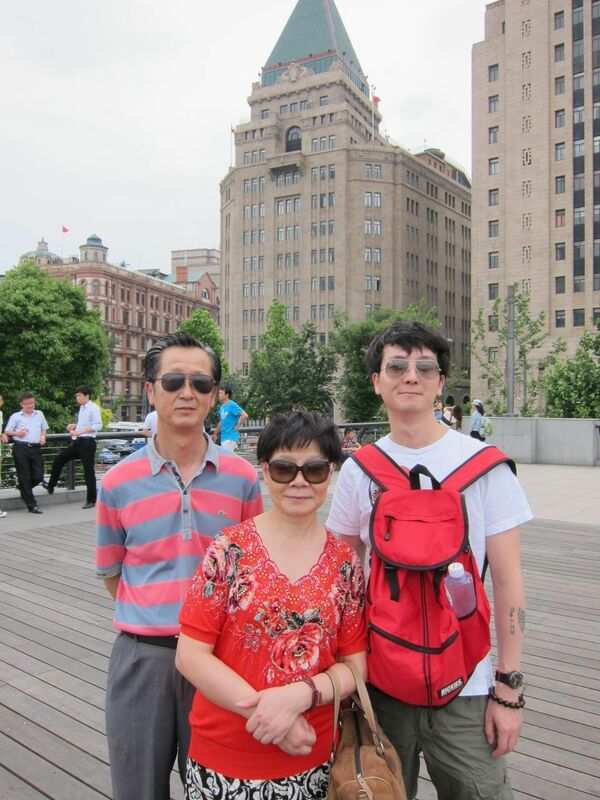 When he was a kid he definitely looked like his mum (https://martalivesinchina.wordpress.com/2015/06/29/childhood-pictures-asia-vs-europe/) but now even she says he looks like his dad, haha. Super cool FIL! He looks like a pretty chill guy. Seems like you get along with him as well as MIL, lucky! Yeah, we have a good relationship. I think mainly because they don’t interfere with our lives, hahaha. Your FIL seems quite a character! Your husband and your FIL do resemble each other! It’s crazy.